HUNMANBY’S COMBINED POUND AND PRISON (LOCK-UP). The work was completed in 1834. After the Enclosure (1809) the Agriculture revolution began in Hunmanby. On Feast and Fair nights the young farmhands subbed from their masters a small sum of ‘monies’ – deducted from their annual wage which was only paid annually – and spent it in the village Inns and Beer-houses. This caused much trouble for the village Constable and his two deputies. The Lord of the Manor therefore gave permission for a Lock-up or Prison to be built at the junction of Lower Stonegate and Sheep-dyke Lane. It had two compartments in order that combatants my be separated, no windows and vented by iron grilles above each stout door. As deleted in the stone above the doors, it was completed in 1834. The two stout doors were fitted with two blacksmith-made locks which would defy anyone without the huge blacksmith-made keys. Just prior to commencing work on the Prison (or Lock-up), the village Pound, then situated at the top of Stonegate (today, 2007, the site is surrounded by white rails) was collapsing to such an extent that it was decided to remove it altogether and rebuild onto the proposed Prison. The Pound was built of large stones from the beach and more had to be brought to the village to complete the rebuild. A gate, bricked-up in the 1930’s was incorporated where the two buildings adjoined. Consequently the work on this unique property was completed in 1834. 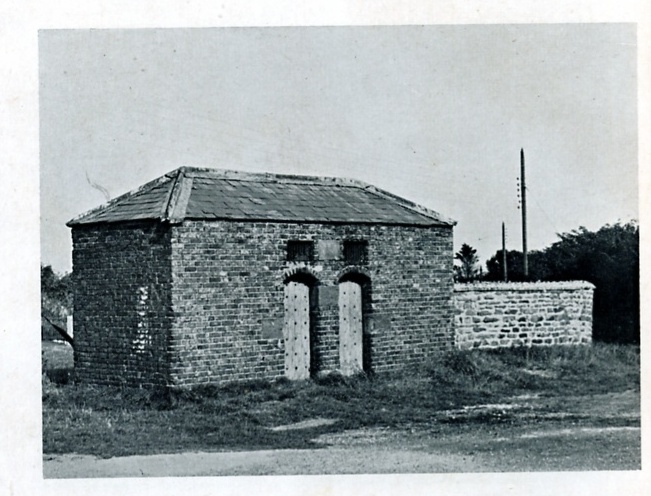 The prison was in constant use until the building of Filey Police-station, complete with several cells and a courtroom was completed in the 1890’s. Still used occasionally in the early 1900’s it was referred to locally as “the black hole” ! After the first World War, the East Riding County Council – to which Hunmanby then belonged - took over all road-works in the County and Hunmanby was designated as the local centre. The lock-ups were ideal for storing tools etc and the large area to the South was excellent for storing tarmac, chippings etc. Every few months it was visited by one of the County steam-rollers, plus living-van for the driver. Each night after completing his work he drove the steam-roller down to Sheep-Dyke and refilled his boiler for the next days work. By mid-1930’s the top of the Pound was in a parlous condition mainly caused by local boys running around its top ! Consequently the Parish Council ordered the top layer to be strengthened and a concrete capping complete with broken glass to be added. At the same time the gate-way was bricked-up. World war Two broke out in 1939 but until the fall of France in May 1940 the village carried-on much as normal. However the summer of 1940 saw Hunmanby Hall Girl’s Boarding School evacuated to the West Riding and Hunmanby became a ‘garrison town’ with the H.Q. etc at Hunmanby Hall. After the fall of France the fear of para-troopers landing was great. The CO from Hunmanby Hall called upon my late father – the village Contractor - and proposed that it was decided to repair the Prison and re-enforce same for the retention of any para-troopers captured locally. All that was required was strengthening the ceilings, making new doors and frames and checking upon the locks. This was done July 1940. Upon taking the huge locks to bits, cleaning and oiling them it was found they worked beautifully. Two of the huge keys were placed – one with the Parish Council and one with my father – about 1952 my father returned his to the Parish Council but now, both have ‘disappeared’. Incidentally the prison was never used during the war. Until 1974, when Hunmanby moved into the North Riding the Prison was still used by the ERCC for road repairs. Later, it became an unused attraction to the village and to prevent it being used as a parking space for motor-lorries etc, both Hunmanby Primary School and later the Womens Institute planted trees and the grass was kept in order by the HPC. About 2000, a determined effort by local yobs to break into the eastern lock-up by breaking away the stone locking slab was easily defeated. After several attempts they gave it up as a bad job. Every attempt must be made to look after this unique village property which I believe to be the only combined ‘Pound & Prison’ in the country.